Place diced beets into 2 cups faux chicken broth and simmer until fork-tender. Drain and transfer to a bowl. Cover the beets with red wine vinegar and set aside. Sauté the leek in a stock pot until softened. Add carrots and potatoes and continue to sauté for a few minutes longer. Add broth and simmer until the potatoes are fork-tender. Add cabbage and fresh dill. Toss the pasta into boiling water and cook until it floats. This should take about 2-3 minutes. Plate the soup in a bowl and add a generous serving of fresh pasta and a few spoonfuls of the vinegar-marinated beets. Garnish with vegan sour cream, dill seeds and dill fronds. Place flours and oil into a food processor. Slowly drizzle the beet juice into the flour with the processor running. Once the dough pulls off the sides and forms a ball against the center rotor the dough is ready. Remove the dough and knead a few times. Form it into a flattened disk and cover with plastic wrap. Set aside to rest for at least 30 minutes. You can make this the day ahead and refrigerate. Once it has rested, run the dough through a pasta machine [I use a hand-cranked model that I picked up for $25. It was well worth the investment] and lay it upon a clean surface to dry out a little bit. Cut into linguine-style noodles. Toss loosely with extra semolina flour so that as it dries further, it will not stick together. Cook in salted boiling water for a couple of minutes until it is cooked through. I love the colors! 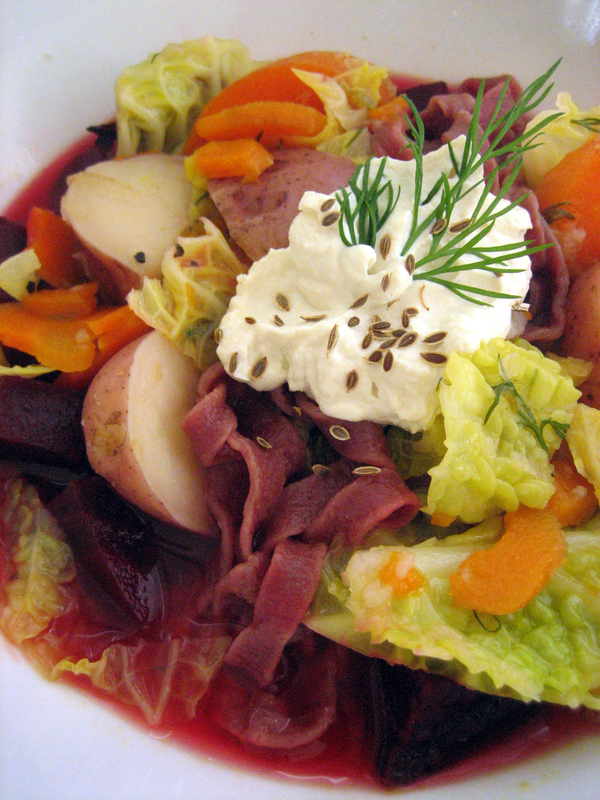 I also love borsch-like soups, although I’m always intimidated about actually preparing my own. Don’t be intimidated! Cooking is supposed to be a creative expression. Get in the kitchen and have fun!